Great projects often start with great hopes and expectations. But if a project isn’t initiated correctly, then those hopes and expectations aren’t anchored in a solid foundation, and your project can drift off course and head for disaster. That might seem overly dramatic, but it’s true. You must anchor your project at the outset by providing it with structure. Ideas are plentiful but having a project plan and executing it will help actualize those hopes and ideas. Of course, there are many steps in the successful execution of a project, but project initiation is the first and, in some ways, the most important step. Get that part right, and you’re on your way to getting the whole project completed on time and on budget. Let’s start at the beginning and define our terms. The first being project initiation. What is project initiation? Project initiation is the first phase of a project’s life cycle. It is at this point where the opportunity or reason for the project is identified and a project is developed to take advantage of that opportunity. What Goes into a Business Case? A business case is used to explain the reason for starting a project. The business case shows how the use of financial and other resources are in support of a business need. A business case will be adaptable, fitting the size and risk of the proposal, but it will structurally be the same from project to project. It deals not in technical issues, but the business concerns of the project, and it needs to be comprehensive. Ideally, the business case should be easy to understand, clear, logical and relevant. The key aspects need to be tracked and measured and justified. There also must be accountability and commitment for the delivery and costs involved. Once the business case has been approved, the next step is taking a feasibility study, which documents potential solutions to the opportunity or business problem that the project is proposed to address. It directs you to the right way to approach the project. A feasibility study researches the opportunity and documents what is required to complete a successful project. It will also identify any other solutions, if available. Risks and issues are outlined at this time, as well as what the proposed solution to each will be if they occur. A project charter outlines the purpose for the project and how it will be structured and executed. In it, the vision, objectives, scope and deliverables for the project are all detailed. Responsibilities for the project team and stakeholders are also described. This next step helps to identify the project vision and objectives clearly. It defines the scope of the project and lists all the deliverables. The project charter will also list the roles and responsibilities of the project team and identify the project’s customers and stakeholders. It is at this point that the project is organized structurally, documenting the project plan and listing all risks, issues and assumptions. A project cannot be initiated without a team to do the various tasks. So, next comes the job descriptions for the people who will implement the project plan. This includes their objectives and responsibilities. Creating a project team requires defining the roles for each member as clearly as possible to keep the work flowing smoothly. Begin by listing all the responsibilities for a position and who the person in that role will be reporting to. Making a detailed organizational chart can help. By listing the skills and experience needed for each position, it is easier to fill that position. It also is helpful to note if there are any qualifications required. Of course, a performance criterion, salary and working conditions must also be defined. A project office is a physical space in the office or work site where the project manager and support staff are located during the project. It houses the communications infrastructure and whatever tech is needed for the project. The first thing to do is figure out where the project office should be, and then make sure that the infrastructure there is properly set up with the right project management office tools and equipment. Now it is time to outline the roles and responsibilities of those in the project office and determine what the proper standards and processes are. At this point, the project office can provide services to the projects under its care. Get in the habit of always reviewing any process to make sure no steps were missed, and this is especially true with the project initiation phase as it is so critical to the success of the project. It is at this time that it is decided as to whether the project initiation requirements have been met. But always review each phase throughout the project life cycle. This is how you can monitor and report on the project’s progress, and make sure that it is staying on track. First, is the project on schedule? Then note if the budget is adequate for this phase of the project. What deliverables have been produced and approved? It’s also important to look over the risks that had been identified and see if any have occurred, and if so how they were controlled and resolved. There are going to be changes in any project, so review if these changes were done correctly to keep the project on track. It is only by starting a project right that you can end it successfully. By having a thorough project initiation phase, you clearly define scope and build a great team to carry that project to a successful conclusion. There is a lot to plan and monitor when initiating a project. An online project management software such as ProjectManager.com offers planning and tracking tools lik Gantt charts, real-time dashboards and task lists to manage a project from initiation to closure. 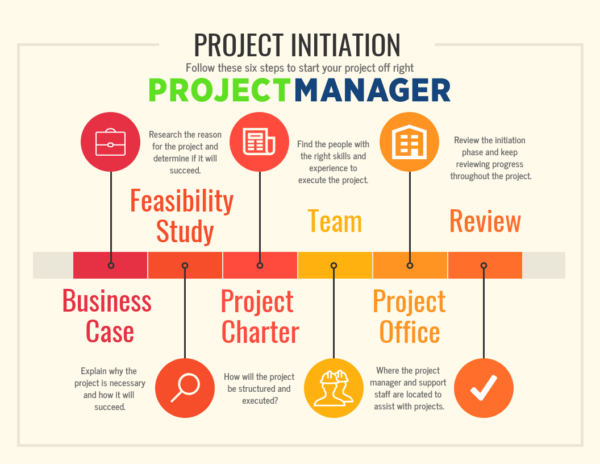 See how ProjectManager.com can help you with your projects by taking this free 30-day trial.